In Trevorder, in the parish of St Breock lived the evil lawyer Jan Tregeagle. Legend tells that he tortured his wife and children to death. This wicked Justice of the Peace is said to have seduced and murdered his own sister in addition to wreaking havoc on the lives of numerous other innocent people. After his death he was accidentally called back from the grave by a defendant in a court case. To keep him from hell but to prevent him wreaking more havoc and possibly to earn his salvation, he was set a number of impossible tasks by the Vicar of St Breward (some say St Buryan) to occupy his time until Judgement Day. These tasks included emptying Dozmary Pool on Bodmin Moor with a holed limpet shell - a task from which he managed to escape and he was pursued across the moors to Roche Rock by the headless wish hounds. His next task was at Padstow, where he is often blamed for the silting up of the harbour. Moved to the Land's End peninsula to carry out his next task he was ordered to bind a truss of sand using sand ropes at Gwenvor, near Sennen and then to carry it to Carn Olva. He managed to achieve this task on a frosty winter night by using freshwater to freeze the truss and in celebration, he swept all the sand from Nanjizal Cove, around Gwennap Head to Porthcurno. 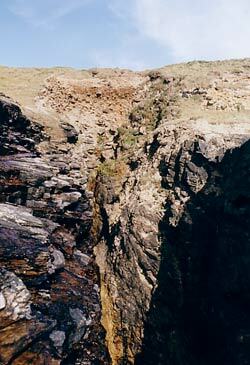 Tregeagle was sent back to Gwenvor and prevented from gaining access to fresh water. He is believed to be there still and on stormy nights people tell of hearing his roars of anger. An alternative version of the tale of weaving sand is set in Padstow. The local people, tired of hearing the wailing of Tregeagle, called on St Petroc, who bound Tregeagle with a chain and led him to Berepper near the Lizard peninsula. He was ordered to carry all the sand from Berepper beach across the Loe estuary to the town of Porthleven, with the task only being complete when Berepper beach was finally sandless. This was impossible as with every new tide the sand was returned to the beach. One night, some of the demons who were pursuing Tregeagle's soul tripped him, and he fell to the ground. The sack of sand that he was carrying fell in to the estuary and Loe Bar was formed. The sandbar cut off the harbour from the sea, angering the local people and the clergy, who had Tregeagle sent to Land's End, where he is still busy sweeping the sands from Porthcurno Cove into Mill Bay. One of the tales from the St Agnes area of Cornwall describes the plight of Bolster, a giant, whose stature was such that he could stand with one foot on St Agnes Beacon and the other on Carn Brea, a distance of some six miles. It is said that Bolster had a wife, who was given the unenviable task of clearing rocks from the area surrounding St Agnes Beacon by her tyrannical husband. One day, Bolster is reported to have met and fallen in love with St Agnes, the virtuous saint after whom the parish is named. Despite her protestations, Bolster would not refrain from his romantic pursuit of the saint and she had to resort to employing a cunning scheme to get rid of him. St Agnes told Bolster that he needed to prove his love for her by filling a hole in the cliff at Chapel Porth with his blood. Then and only then would she believe that he loved her. Bolster, eager to demonstrate the sincerity of his feelings, agreed to do this. However, what Bolster did not know was that the hole in the cliff drained to the sea. The lovesick giant allowed his life blood to pour into the hole for hour after hour until he finally collapsed with exhaustion and died. The truth of this tradition is maintained today not only in the earthwork at the foot of the Beacon which is known as the Bolster Bank but also in the mysterious lack of stones on one area of the Beacon, where Bolster's wife had removed them, carrying them to the summit of on the orders of her husband. Chapel Porth can be seen to have red stained cliffs in an area on the right of the beach near a hole in the rocks which extends from the clifftop to the sea ! Cautionary tales such as the fairy revels on the Gump at St Just, which demonstrates the dangers of greed and what happens if you steal from the little people. The small people were also believed to take children who were being neglected by their parents, not forever, but to clean and wash them in morning dew before returning them. This belief was widely held in the Land's End area. The tale of Betty Stogs and Jan the Mounster of Towednack recounts this. The devil features in many of Cornwall's folk stories. Dando, a priest in St Germans, having strayed from the moral path by indulging in earthly pleasures, found himself face to face with the devil disguised as a huntsman. His arrogance and love of alchohol took Dando straight to hell. As there are folktales in Cornwall about the devil and his demons, there are many stories too of the Saints and miraculous events. 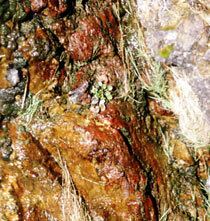 Constantine near Padstow has a holy well dedicated to St Constantine. The well had been allowed to fall to ruin by the people of the parish. During a long dry summer when crops were failing the parishioners went to their priest and begged for help and to be forgiven for their irreligious deeds. The priest told them they must clean the holy well. They laughed at him, went away, ignoring his advice and the drought continued. Again they asked and again they ignored his reply. On the third time of asking, in desperation they took his advice and set to cleaning the well and its surroundings. As soon as the well was clean, sparkling clear water gushed from it and the people drank, washed and refreshed themselves. Soon after the skies clouded over and rain fell saving the people and their crops. Many legends are associated with Cornwall's industries of mining, fishing and farming. Miners are said to have been superstitious about 'bullhorns' (snails), and if meeting them on their way to work, would leave them a part of their meal or some grease from their lantern for good luck. These legends are kept alive today not only in books but also by Cornish men and women in the spoken form which is known as Droll Telling. For more Cornish Folklore and Legends see a list of locations at the bottom of this page and in our A-Z of locations in Cornwall. Some books are available new and others used from bookshops and online stores subject to availability.